The line-mode browser, launched in 1991, was the first readily accessible1 browser for what we now know as the world wide web. It was not, however, the world’s first web browser. The very first web browser was called WorldWideWeb2 and was created by Tim Berners-Lee in 1990. Web browsers today are quite powerful. They can run on all sorts of devices and display all kinds of content from plain text to images and video—you can even play games in modern web browsers. It wasn’t always this way. The line-mode browser could only display text. You couldn’t even use a mouse to click on links—you had to type in everything using a keyboard …even if you just wanted to follow a link! It sounds like a clunky experience (it was!) but wouldn’t you like to get a feeling of what it was like to browse the web back then? Well, thanks to the power of modern web browsers, you can. Launch the line-mode browser simulator! 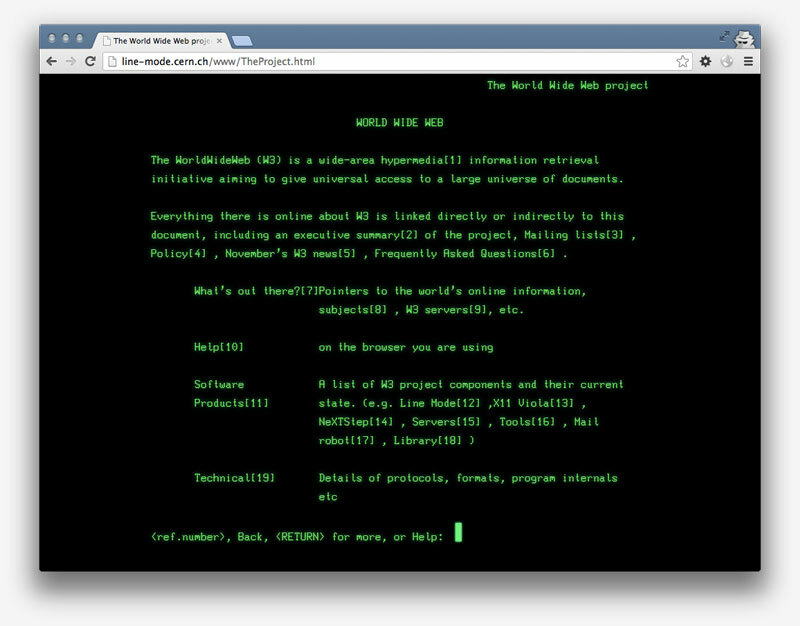 A good place to start your line-mode browsing is with the first web page ever published. Using the line-mode browser simulator, you can see how this page would have looked over twenty years ago. What’s amazing is that the first web page still works in a modern browser. You’ll also find that many modern web pages will work in the line-mode browser. They won’t look the same, and you won’t see any images, but they’re still readable. That’s because HTML is backwards-compatible by design. The vocabulary has grown in scope since Tim Berners-Lee first introduced just a handful of tags but new browsers still understand all the old tags, and the line-mode browser simply ignores any tags it doesn’t recognise. Thanks in part to the forgiving nature of HTML, the world wide web has become a huge success. The web has changed a lot in two decades but one fundamental principle has remained constant: you don’t need to ask anyone’s permission to publish a web page. Inspired by the culture of collaboration and sharing at CERN, Tim Berners-Lee and Robert Cailliau released their project into the public domain in 1993. That means nobody owns the world wide web. Or, to put in another way, the web belongs to all of us. Most computers were not very powerful in 1991, certainly not as powerful as the NeXT machine on which Tim Berners-Lee built the first browser. While that version was great for demos it wasn't great for spreading use. The line-mode browser changed that, allowing almost anyone with a terminal — no matter how dumb — to access and browse websites. Yep — the software really was called WorldWideWeb. The name was decided on a whim over lunch at CERN in the early summer in 1989. Tim Berners-Lee and Robert Cailliau had to submit a proposal for funding for their still unnamed project. Tim suggested, "Why don't we call it World Wide Web?" and Robert said, "Sure, why not." They both figured they could change it later if they needed to.